Please read these carefully, if you have any questions please email sales@montanararities.com or call 406.396.9468 and we will be very happy to help. 1) Payment may only be made by wire transfer. 2) Foreign sourced funds will not be accepted, and 3rd party delivery will not be made without a satisfactory explanation (Montana Rarities' Anti-Money Laundering compliance officer will determine if the reason is adequate). 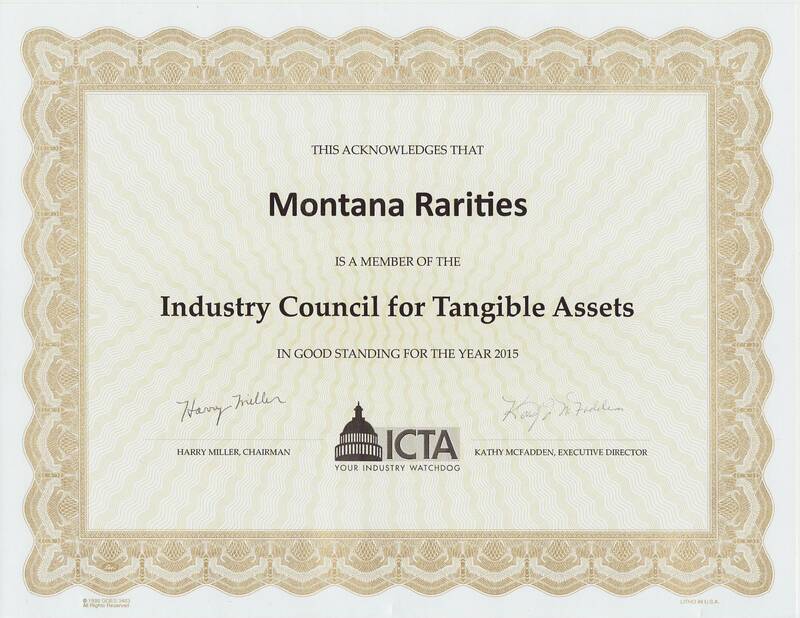 If anything about the payment, delivery instructions or customer seems suspicious Montana Rarities has the option to cancel the transaction. 3) Price locks can only be made during normal business hours (9am to 5pm Mountain Time, Monday to Friday). 4) We do not keep large quantities of all inventory items on hand. At the time order is locked an estimated ship date will be provided, but not guaranteed. It could take up to 2 weeks to deliver your precious metals order. 5) If applicable, orders will be shipped with full insurance. In most cases the order will be drop-shipped from a distributor, and will have insurance included. Shipping charges will be included in the locked pricing. 6) Once a wire transfer has been initiated orders cannot be cancelled, as commitments to other dealers or wholesalers will be made as part of the process. If extenuating circumstances require a cancellation then we will try to work with you, but it is very likely that it would involve expenses which will be deducted from your refund. 7) Pricing, margins, minimum quantities and delivery times are all subject to change. While every effort is made to ensure that the information on the website is current, not every eventuality can be foreseen, and we cannot guarantee that all of these things are correct.